This file supersedes the file Yarn twist.png. It is recommended to use this file rather than the other one. 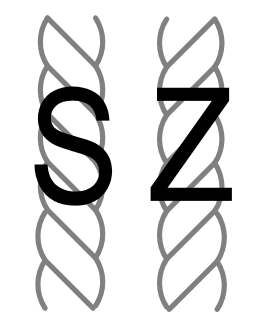 Reason why to use this file over the other file: "left-handed on left, right-handed on right rather than reversed"
"Twist" in spun yarns or ropes is often labeled S-twist or S-laid (for left-handed twist) and Z-twist or Z-laid (for right-handed twist), due to the respective left and right of the central sections of those two letters. To visually determine the handedness of the twist of a rope/yarn/etc, sight down a length of it; the direction of the twists as they progress away from you, left or right, reveals their handedness. This is a retouched picture, which means that it has been digitally altered from its original version. Modifications: Swapped sides for S and Z to make more intuitive, previously Z, which represents Right-handed twist, was on the left side of image making captions, etc. more cumbersome to write, also removed border as superfluous. The original can be viewed here: Yarn twist.png. Modifications made by Dfred.